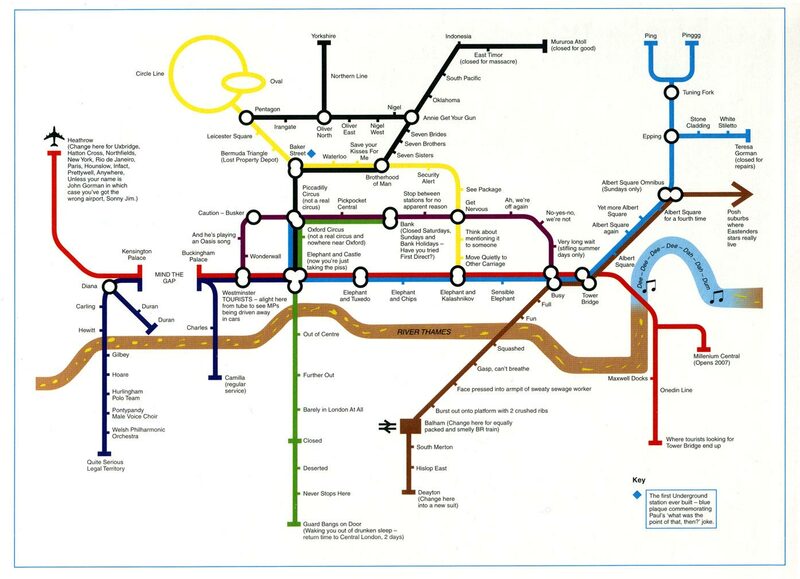 This Tube map parody is pretty funny, even if I don’t get most of the London in-jokes. Can someone from there please explain the blue “Dee-dee-dee-dah-dah-dum” curve in the Thames? And what’s with the “gap” between Kensington and Buckingham Palace? Update: Sparticus tells me it’s Eastenders. Now I’m interested. Spart is correct, East Enders. I was even hooked for a while. My wife love it. The Gap joke is because when the doors to the train open, a recorded voice says “Mind the Gap” and “Stand Clear of the Doors Please.” Obviously, the gap one is more popular. It has been on Top of The Pops regularly since it’s debut. That’s also what the “albert square” bit is about, as albert square is the fictional place in London in which Eastenders is set.